Together with the European sports clusters Sports & Technology, Flanders Bike Valley, Cluster Montagne, and EPSI, INDESCAT travelled to Brussels on November 22 to present the findings and results of the European internationalization project EU4SportsClusters Alliance. Four different companies of these clusters that travelled to China and the United States in two trade missions organized within the framework of this European project, took part in the event. The project has facilitated that 30 European companies and organisations that participated in these missions have signed up to 19 contracts with Chinese and American companies. 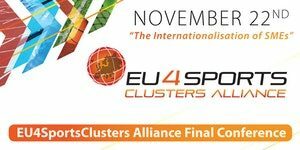 We are pleased to invite you to attend the EU4Sports Clusters Alliance Final Conference on “The Internationalisation of SMEs”, which will take place on November 22nd at ACCIÓ premises: Rue de la Loi, 227, 3rd floor, B- 1040 Brussels (Belgium). EU4SportsClusters Alliance is a project co-financed by the European Commission to implement and test a Joint Internationalisation Strategy for the European Strategic Sport Clusters Partnership, developing new value chains and exploiting international opportunities for SMEs, especially those existing in third markets outside the EU. The alliance is made up of five European partners (INDESCAT, from Catalonia, Spain; Sports & Technology, The Netherlands; EPSI –European Platform for Sports Innovation–, Belgium; Cluster Montagne, Auvergne-Rhône-Alpes, France; and Flanders’ Bike Valley, Belgium).